The Brazilian Food Tales is one the most spectacular products that came out recently in all over Iguassu Falls. tHE DIVERSITY OF CULTURES IN BRAZIL FAVORITED THE MIX AND CREATION OF A VAST VARIETY OF DISHES, COSTUMES, MUSIC AND FOLKLORE. AT THE HOUSE OF THE CHEF, THE CHEF FABIO DEL ANTONIO - AN INTERNATIONALLY TRAINED CHEF - LITERALLY INVITES EVERYONE TO LIVE THIS OUTSTANDING PRIME DINING TOUR THROUGHOUT THE HISTORY OF CREATION ABOUT THE MOST INTERESTING AND TASTY BRAZILIAN DISHES. proud of being brazilian and a passionate lover of Brazil's gastronomy diversity, Chef Fabio discloses many recipes and insights about popular and gourmet brazilian gastronomy in a language that everyone can understand. 6-course menu of hand-picked Gourmet creations of the Chef! FABIO speaks English, French and Italian which makes the understanding of the explanations about his dishes even more clear and free of miss interpretations. It is not a cooking class! The Brazilian Food Tales is a gastronomic-cultural rescue of the far rich Brazilian Gastronomy, Starting off from the Guarani Indian's cooking and the historical background of each mixing of local ingredients. But no, this is not a mere cooking class, it is a Immersive Experience which offers learning covered by rich flavors. it is an unique dining experience, where guests participate in the learning and tasting of the WONDERFUL creations of chef Fábio. For matters of anti-spoilers reasons We are not going to review all the items of the 6-stroke menu of Chef Fabio but, We can assure that it is really insightful. 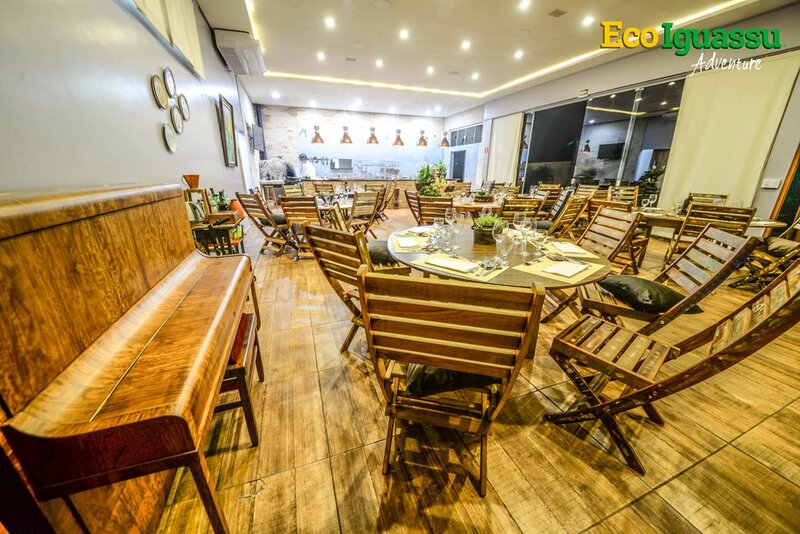 There are many myths about Brazilian Gastronomy like the real background of the creation of many Brazilian popular dishes, so it's not only learning how the dishes are made but how they were created as well. aLSO PART OF THE EXPERIENCE IS THE DISCOVERY ALONG THE WAY ABOUT SO MANY SECRETS. Among the many surprises, if Music was not part of this Experience, We would not be talking about Brazil! The capacity of the salon is 50 people, also the whole experience was designed up to that amount of guests hence all the explanations from the Chef are via microphone. For more than 50 guests other types of arrangements can be organized, the House of the Chef is not a traditional daily open restaurant, it only opens via previous reservations therefore is unique and exclusive just for those booked for the Experience. And the other plus of exclusivity is the fact that there is no other groups around, once You have your own group organized the whole infrastructure of the Venue and Dining is yours. CLICK IN THE BOTTOM BELOW TO GET A FREE E-BOOK ABOUT THE brazilian food tales. ARE YOU A TRAVEL AGENT LOOKING FOR GOOD IMAGES AND MORE INFORMATION ABOUT THE brazilian food tales? CLICK IN THE BOTTOM BELOW TO REQUEST ALL THESE PICTURES IN HIGH RESOLUTION AND INSIGHTS ON HOW TO FIT IT IN YOUR IGUASSU ITINERARY, OUR MARKETING DEPARTMENT WILL BE PLEASE TO SEND THEM TO YOU! Six-stroke menu: Entries, main courses and desserts. Drinks, water, soft drinks and wine. LUNCH/DINNER - BRAZILIAN food tales - a la cart - 6-stroke menu - music - SAMBA - brazilian culture. Features: Toilets, air conditioning, swimming pool, located in a reserved area of the city. Features: rounded or square tables accordantly to the guests preferences. Features: The best of Brazilian Popular music can be aded to the experience. Be the first to know about news of new tours and restaurants in Iguazu Falls as well as get early access to all our services portfolio. Avenida das cataratas, 1419• Foz do Iguaçu, Brazil.